HYDERABAD: During my recent visit to Shirdi, I wanted to explore some interesting places nearby. Daiwik Hotel where I stayed, was offering packages to places like Shani Shingnapur, Nashik, Aurangabad (Ajanta & Ellora) etc. I chose to visit Shani Shingnapur as it was recently in the news, having lifted the ban on women’s entry, yielding to a high- voltage campaign by activists. The temple trust recently allowed women to enter the sanctum sanctorum, breaking the tradition followed for several decades. Shingnapur is also famous for the fact that no house in the village has doors, only door frames. Villagers believe that god Shani punishes anyone attempting theft. I was quite curious to see this village and know more about the place. So, I set out in the cab arranged by the hotel, accompanied by Digambar. During the two hour ride, every now and then I would spot a “Rasavanthy” on the way. You may wonder what “Rasavanthy” is. It is the name given to sugarcane juice in these parts! When you see a multitude of colourful balloons hanging from trees, with a few swings by the side decorated with bunches of colourful balloons, bright red plastic chairs neatly placed in a row, then you’ll find a bull cheerfully going in circles while a wooden contraption neatly extracts fresh sugarcane juice. Well, that’s a Rasavanthy stall. You’ll find them in rural Maharashtra, amidst onion, corn and sugarcane fields. Tukaram, the cab driver extolled the merits of sugarcane juice thus extracted versus the juice produced by an electric machine. He insisted that it is much tastier and doesn’t turn black even after an hour. I stopped at one of the stalls, to take pictures and videos of a cheerful, patient bull that was relentlessly working to get gallons of the sweet juice for human consumption. We sat under the tall trees, surrounded by the festive decorations. I had the most delicious sugarcane juice I ever tasted, with an equally sweet sounding name - Rasavanthy. Drunk on the sweet juice, as I was slipping into a slumber, Tukaram started to narrate the story of Shani Shingnapur. The deity here is Shani, a “Swayambhu” that had self- emerged from earth many centuries ago, in the form of a black, imposing stone. Legend says that when a shepherd touched the stone with a pointed rod, the stone started bleeding. On that night Lord Shanaishwara appeared in the dream of the pious shepherd and directed him to build a temple without the roof, as he preferred to be under the open sky. He asked the shepherd to do daily pooja and ‘Tailabhisheka’ every Saturday without fail. In return, he promised to make the village free of dacoits and thieves. As we reached the village I started looking at every house curiously. True, there were no doors anywhere. As we stopped the car to take some pictures, Amol, a cheerful young lad with a sunny smile offered to show us around. His two grandmothers, Sakku Bai and Tulja Bai were sitting on the porch of their house, busy talking and laughing as many kids were playing around Amol said they all live under one roof, more than 25 of them in their family. I could see the happiness in their faces and the joyfulness in the children. Sakku Bai, his maternal grandmother laughed heartily when I said her necklace was looking nice. Then Tulja Bai showed hers and received the same compliments from me and everyone burst out laughing. 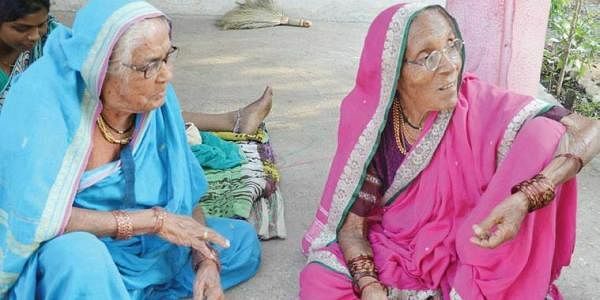 As we went around, Vittal Borude, the matriarch of a house was sitting in the warm sun, playing with his grandchildren. His wife Vimala said that she came as a bride, to this house with no doors. No one in the village seemed to have ever seen a door in their houses. We passed a tailor shop in a garage with no shutter. The tailor said he covers the threshold with a cloth in the night, after closing the shop. In the busy shopping complex too there were no doors or shutters in the shops. The goods are left as they are in the night, only to resume business in the morning. We went to the temple complex, which is quite huge and impressive. There is a specified place for devotees to place their offerings like rock salt, black til and oil on a wired a mesh. The oil gets drained and collected in a tank below, which is again pumped up, to fall on the top of the stone idol of Shani Bhagawan, through a pipe. I was quite impressed by this modernised ‘abhishekam’ that eliminates any mess that is created by the oil offerings. Back at the hotel, I had one more gastronomic experience, which is typically Maharashtrian. 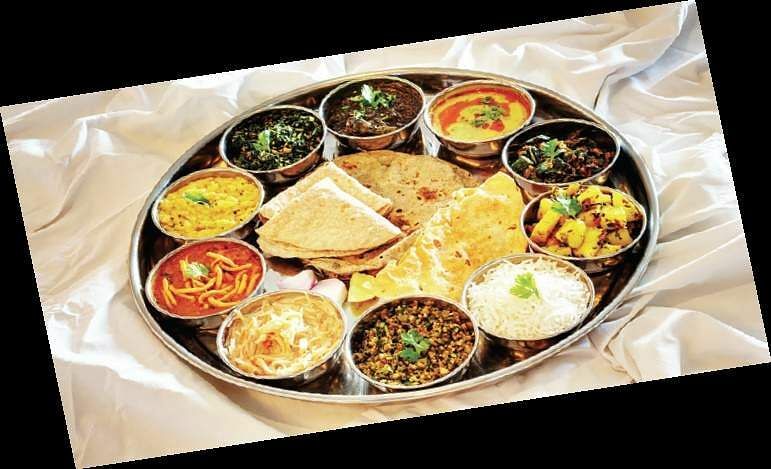 The huge Marathi Thali consisted of Matki, Pithla, Baigan, Bhendi Masala, Aloo Jeera, Yellow Dal Tadka, Koshambari, Shrikhand, Paratha, Rice, Papad, Pickle and Thecha. I could hardly breathe after eating just one-fourth of the thali. That’s when I gave up, realising that one needs the appetite of a warrior to tackle it!